How Do You Spell HOB? 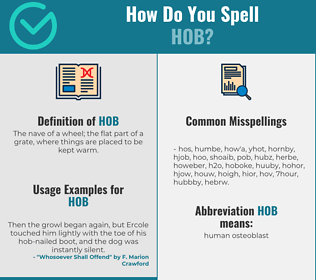 Correct spelling for the English word "hob" is [h_ˈɒ_b], [hˈɒb], [hˈɒb]] (IPA phonetic alphabet). Below is the list of 174 misspellings for the word "hob". The nave of a wheel; the flat part of a grate, where things are placed to be kept warm.